So I spent most of the rest of the year raising and enjoying my chickens. My red stars proved to be calm, friendly, prolific egg layers. The roosters (why did I get straight run?) were better for the table than I expected. Soon I found out about Buckeyes and the attempt to bring them back from the critically endangered list. 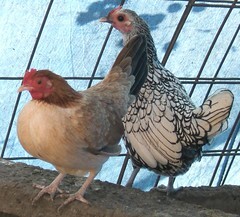 The insites provided by the ALBC in evaluating chickens for improving various qualities I found fascination. Soon I sold my flock of Red Stars and Marans to make way for a flock of Buckeyes. I also fell in love with the true Japanese, discovering the difference between hatchery stock and the real thing. I was able to acquire some black tailed white show stock from an exhibitor getting out of Japanese. Other interests evolved and I found myself raising coturnix, then bobwhite quail. I acquired some mottled Japanese to go with the black tailed white (BTW) I sold the silver sebrites and the Old english game banties only to acquire red blue oeg bantems, a pair of polish, some bantam buckeyes, in and out of longcrowers, some black Japanese. I sold out my royal palm and bourbon red turkeys, acquired several types of bobwhites.